Our fine friends at Aaron Brothers are proud to present the in-store live art event, ARTRAGEOUS, this Saturday, September 17. 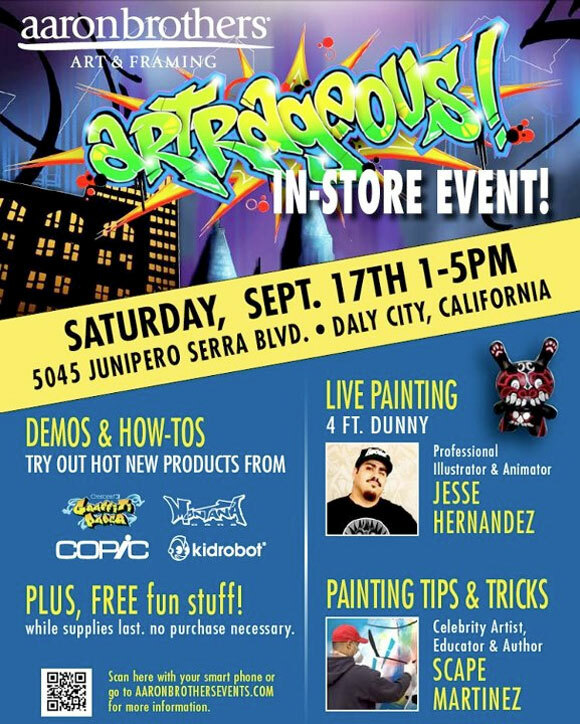 Join Jesse Hernandez, and Scape Martinez from 1-5pm at 5045 Junipero Serra Blvd in Daly City, California for painting demos using rad new supplies by Graffiti Paper, Montana and Copic. Jesse will be busting out the big brushes as he paints a massive 4-foot Dunny live on the spot. ARTRAGEOUS continues Saturday, September 24 in Austin, Texas with more massive customizing by MAD.